Interact with our artisans and tradesmen! 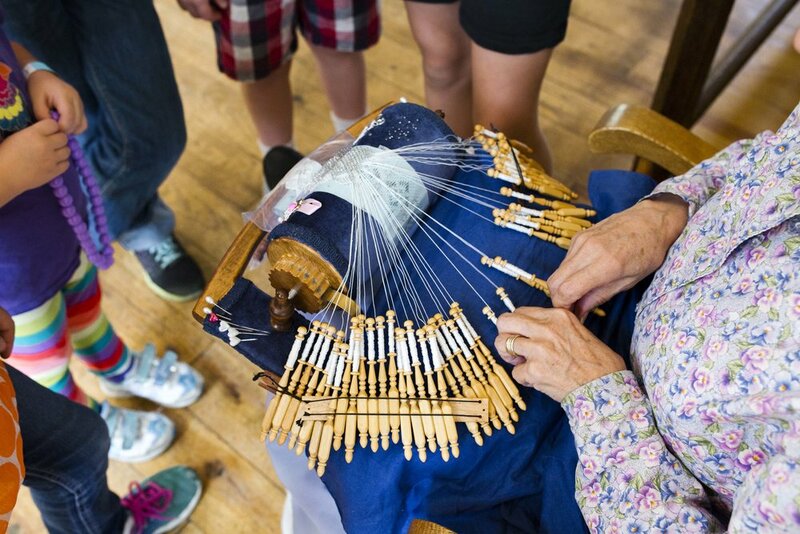 When you visit their shops, you will be awe-struck by their heritage skills and you'll see how these amazing people brought the Utah territory to life. Each artisan has learned their craft, many of which are dying arts. We have preserved these important historical demonstrations and you will find them to be one of the favorite parts of your visit. Our blacksmith will demonstrate how the West was built with a forge, anvil and hammer. As you watch him work, he'll recount how pioneer blacksmiths made and repaired farm equipment, tools and generally kept the settlements in good working order. And don't ask him about shoeing the horses! Blacksmiths didn't shoe the horses; they left that job to the farmers! Most furniture was too heavy and bulky to be brought across the plains in pioneers' wagons; so skilled furniture makers were in great demand in the settlements. At our Dinwoodey Furniture Shop, (look for the building with the chair on top) a woodworker will explain how local soft wood was used for furniture in the absence of more favored eastern hardwood trees, and then painted to look like hardwood. At the Jewkes Home you can card wool and watch the spinner turn it into yarn on the spinning wheel. She'll also explain how various native plants were used to make colorful dyes for the yarn. At the Deseret News Press you can learn how early newspapers were printed one page at a time on a simple sheet-fed press. Over in the Saddlery, a skilled leatherworker will explain how a deer or cow hide becomes a fine leather pouch or a saddle. And here you can try your hand at stamping a leather craft to take home! So come watch how our history was shaped in the skilled hands of real craftsmen.